RGB's association with NDC Co., Ltd., Japan offers the world's premier self - lubricated bearing. 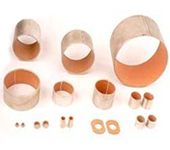 (A mixture of PTFE and Lead is impregnated to a sintered porous layer on a steel back, improving mechanical strength and minimizing thermal expansion). Self lubricated bearings FB® can withstand compressive strength to 3000 kg/cm2 or more. Dry Star F-920 is complete oil less bearing, which has an excellent self-lubricating characteristic without any pre-lubrication or oil bath lubrication. A mixture of PTFE and Lead creates an excellent lubrication and wear resistance. Each characteristic test rating (longevity, friction coefficient and wear) proves to be superior compared to other similar materials. FR® are the world's leading bearings for gear pumps and other hydraulic applications. This bearing has excellent cavitation erosion resistance and has the lowest friction coefficient with extremely high wear resistance, allowing it to accept PV's to 490 Mpa.m/min (5,000 kg/cm2.m/min) and can be used in semi dry or lubricated applications). 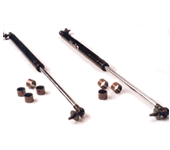 FR® bearings are widely used in Gear pumps, vane pumps, piston pumps, compressors, shock absorbers, struts, forks and industrial OE applications. In addition FR930 Lead free self-Lubricating Dry-type Bearings are widely used in applications such as automobiles and machinery. Increasing concern for the environment is forcing many industries to demand lead-free materials. NDC's FR930 dry-type lead-free bearing answers this concern and sets the standard for the 21st century. Also FR800 Dry type bearings, which have good electric conductivity, are also available. 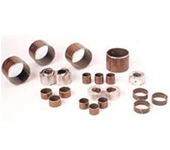 Automotive and other Industrial Original Equipment Manufacturers in India are regularly drawing their requirements of these Dry bearings.